Sometimes the design of an item transcends time: the Anglepoise lamp is one of these items. It looks at home in just about any period of home or office. Form following function has resulted in a lamp that is not only good looking but is very good at doing what it does; easily adjustable to any angle, no desk is properly dressed without one. This fellow always has interesting pieces on his stall, with a chair or two worth stroking and a quick mental reckoning on where we can squeeze one more chair into the house. This month, however, it was a teak wall mirror that caught my eye. Of unknown manufacturer, the size would make it just the ticket to be hung near the front door for a fellow to check his tie knot is straight before stepping forward into the outside world. 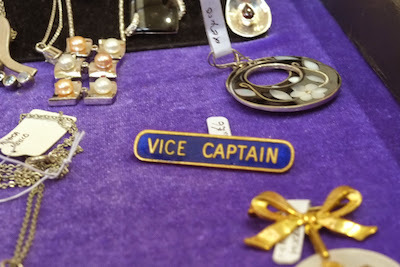 Maintaining the school-related theme, around the corner from the ink well was an enamelled “Vice Captain” badge. Having never been a Vice Captain, I can only marvel at the thought of a school which celebrates vice to such an extent they actually appoint a Captain. My cycling pursuits entail travelling around the country to various events, and a suitcase can be a little bulky. I am, however, convinced that a good size Gladstone bag would fill the gap I have mentally created in my baggage repertoire. This particular bag had spent a fair few years in an attic before being rescued, cleaned and offered for sale. The lining needs a few tacks to put it back in place and the leather feeding up, but, looking at the quality and feel of the brass catches, with a little TLC this would make a lovely weekend bag. 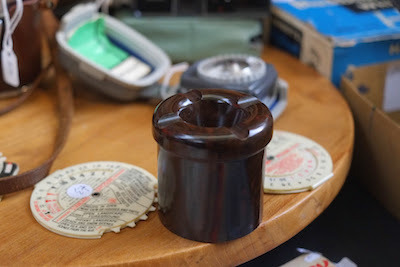 More Bakelite I’m afraid. The reasoning behind my choice; its diminutive size reminded me of the scene in North by North West when Cary Grant borrows Eva Marie Saint’s travel razor to shave in a public washroom. Just across from the market, 20th Century Stores is now fully open. The organisers of Vintage Village and everyone involved in Stockport Old Town are doing a splendid job of dragging Stockport kicking and screaming into a destination town again - I take my hat off to you, one and all. Originally from a private collection of around 30 suitcases, the quality of this trunk has to be seen and felt. From the last days of the Empire when a gentleman readied himself for a Grand Tour via sea and steam. Truth be told, if you were to use this on a latter day “Grand Tour” your baggage allowance would be entirely taken up by the trunk itself (and maybe a few light under garments). This trunk is nowadays better suited as a storage solution, as we are now advised to pop our summer/winter wardrobes away at the end of a season. This particular trunk would provide enough stowage for the wardrobe, and if you ever did happen to embark on a Grand Tour the packaging of your apparel would be one less thing to worry about. I’ve ridden bikes for as long as I can remember but about six years ago my wife and I managed to successfully apply for a couple of places on the London Tweed Run. As the name suggests, tweed is the order of the day and the last minute search for a set of tweeds opened up a whole new world of Harris, products made in "Great Britain" with a quality and style that is sadly missing in much of today’s clothing. After last month’s Finds of the Fair by my good wife, I have been given the go-ahead from the organisers to write a piece from a more gentlemanly point of view. A funny one this one. Usually I am a stickler for a product being an original - “Eames style” is not an Eames - and usually, by biding one's time, and applying some searching skills, the genuine item can be sourced at a similar cost to the reproduction. 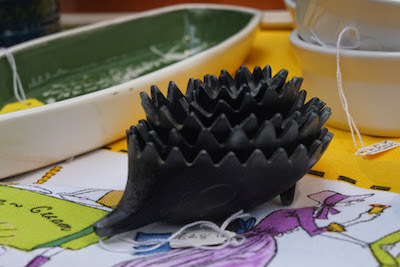 This brings me to the hedgehog ashtrays, an unashamed copy of the Walter Bosse originals, cast out of the wrong metal with one missing, but they still have a real charm that appeals to me. They are a good looking item in their own right, I also think the fact that they are not just any old copy, but a copy from the national Russian airline gives them an interesting Cold War era provenance. I know one is missing, but a full set would cost more than double the price and who knows? Somewhere out there is a lonely orphan hedgehog waiting to complete the set for a few pounds. Originally from Boteler Grammar School, Warrington, these were being sold off in an “as used” condition. Fortunately the good fellow at We Used to Have One Of Those rescued them, cleaned them and offered them to the visitors at the Vintage Village. I did actually notice these at last month’s VV but became waylaid; this month, however, they were not going to be missed. Unfortunately, I am old enough to remember similar ink wells in the desks when I went to school - I must stress that they were no longer in use. 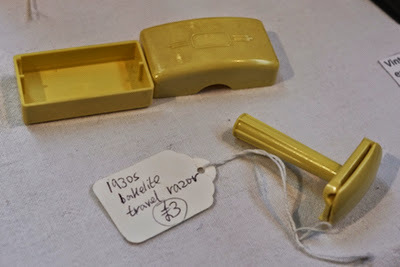 Apart from the age-related memories, what I particularly enjoy about them is the wonderful, tactile Bakelite they are made from, and the unmistakeable squeak when you unscrew the lid. I think most of us can remember a novelty tray like this, normally on a kitchen windowsill, usually with important bits and bobs on it - curtain hooks, a small 12v torch bulb, odd buttons - all the life essentials needed for easy access. Tweed, good quality vintage tweed. I have a problem finding good quality tweed jackets as the average tweed wearer of yore was typically a little shorter and rounder. Vintage Village has several purveyors of good quality tweed; fit may still be an issue but the joy of shopping at the Vintage Village is you know that if you do hit upon the correct size the quality will be there. We were unsure of the manufacturer, but the “front room” tableau that had been arranged set them off to a tee - a veritable mid-century parlour. Taking my role as Finder of the Fair in utmost seriousness, I felt obliged to test the chairs for comfort and, of course, build quality. On sitting down I was a little surprised at the diminutive size of the chairs, although after several hours at the Vintage Village, it has to be said they were extremely comfortable and not a little effort was required to start moving again. Mr Rodgers has certainly come up with the goods this month - what a marvellous array of vintage items for all budgets! We heartily recommend that you visit Adam's Guvnors' Assembly website, and there's also the Guvnors' on Facebook, and you can seek him out on Twitter to tell him what a great job he's done this month!